I read both Beaky Malone and St Grizzle’s in preparation for this blog tour, although I’d already chosen St Grizzle’s side, and I made the right choice in terms of Chaos Castle preference but Beaky Malone was very funny and well worth a read too. I’m not good at taking sides in battles! 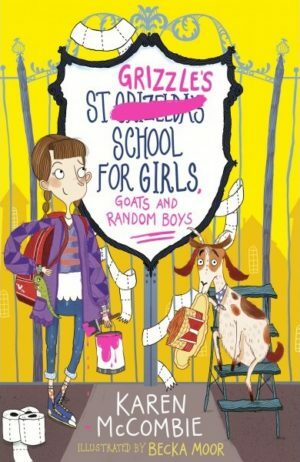 St Grizzle’s School for Girls, Goats and Random Boys (and we so love that title) starts with ten year old Dani not really listening to her mum before realising what she’s missed is her future life at a BOARDING SCHOOL while her mum goes to watch penguins’ bums. I’ve been reading this aloud to my 7yo and she found it very funny. The complete chaos of St Grizzle’s (formerly Griselda’s) school very much appeals here! Classes in circus skills and den making, or learning the Periodic Table song sound far more fun than sitting at desks. I liked how St Grizzle’s managed to include diverse characters without it feeling forced, and because of the “random boys” this is a story to appeal to all genders, despite being set in a girls’ school. The lack of gender stereotyping is refreshing, and the up-to-date nature (Dani makes stop motion films on her phone for YouTube) makes St Grizzle’s directly relatable to today’s children. Every night had to include “just one more chapter” because we wanted to find out what would happen next. and we can’t wait for book 2 which has the equally awesome title of St Grizzle’s School for Girls, Ghosts and Runaway Grannies. I was a bit of a teacher’s pet to be honest. I went to a very small primary school where there was only about 12 of us in the class so it was nice and cosy. 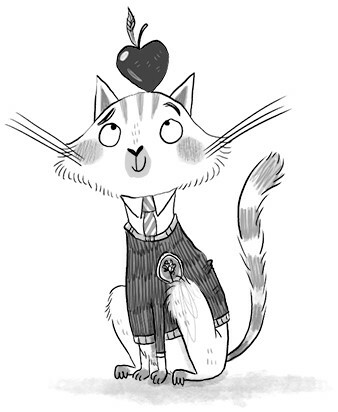 When I saw Karen’s character description for Ms Murphy I automatically thought about one of my old teachers who was a little bit bonkers and very fun to be around, so I definitely pulled a bit of inspiration when doodling her.